Among the controversial bills that the Governor attempted (probably successfully) to approve under the news media radar this afternoon was the hugely controversial proposal detailed here by NC Policy Watch reporter Sharon McCloskey last month to establish a secret and unaccountable “star chamber” system for disciplining wayward state judges. The bill was opposed by both the N.C. Bar Association and the N.C. Advocates for Justice — which represents the state’s trial lawyers. All in all, this afternoon appears to be shaping up as the icing on the cake of what is, without a doubt, one of the most disastrous years in public policy in state history. Its good to be patient sometimes. Sooner or later, the truth breaks free. It is relentless. “…one of the most disastrous years in public policy in state history.” You are correct. 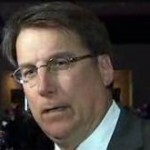 McCrory is as bad as a twenty-first century American politician could be. Seriously, how on earth did Charlotte elect this smug son of a b*** so many times? It is all about the Democrats having to give up power. Bluepoint/Blueprint will destroy the Governor and the truth be damned. Progressive Pulse is leading the charge. Read their manifesto. “It is all about the Democrats having to give up power”, what is the relevance of your comment? Alan, she/he throws words together that she/he thinks sound good just like pat. Manifesto? Really? I bet FJ doesn’t know who named their precious capitalism ideology that they cling to like the bible and atlas shrugged.